A native of the Great Lakes region, Doug Zurn grew up sailing and boating. His father owned boats that exposed Zurn at a young age to the design talents of Phil Rhodes, Ray Hunt and Jim McCurdy. 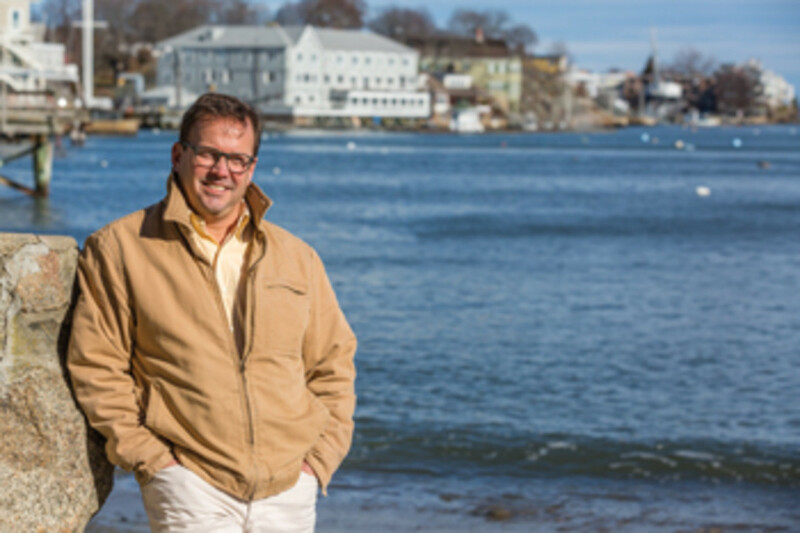 Zurn established his company, Zurn Yacht Design in Marblehead, Massachusetts, straight out of Westlawn School of Yacht Design in 1993 and spent his early career apprenticing for some of the industry’s most respected designers and builders. 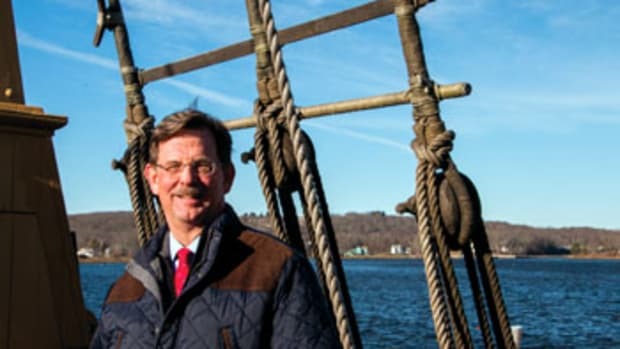 He’s a member of the Society of Naval Architects and Marine Engineers, the American Boat and Yacht Council and the Yacht Brokers Association of America. Twenty-four years after hanging out his shingle, Zurn has 149 designs and more than 450 launches under his belt, including the MJM line. 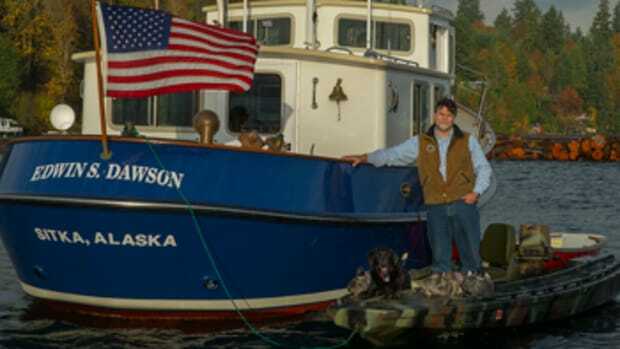 He’s established a reputation for boats that are beautiful, efficient and seakindly, and which leave no detail to chance. First memory of being on a boat: I grew up a stone’s throw from the Erie Yacht Club in Erie, Pennsylvania. At a very young age, it was just a quick ride aboard a sturdy metal Tonka dump truck down a ravine embankment to boat heaven. I was the youngest of five, and by the time I came along, my father was on his second sailboat, a wooden Philip Rhodes-designed 50-foot sloop — the 6,000th boat built at the prestigious Abeking & Rasmussen yard in Germany. She was outfitted with another Rhodes design, the 7-foot Dyer Midget Pedug (named for my brother Peter and me). Her deck chocks were located over the main cabin deck hatch, so she had a translucent bottom to allow light through. While I’m sure I spent time aboard the sailboat, my first memory was aboard Pedug in the yacht club basin. There was a lengthy piece of 3-strand that kept me from sailing too far from the mother ship. Later, as my mind matured, I recall studying the action of the water passing under her translucent bottom as the sun reflected light. First boat you owned: Early in my career, while working in Mt. Desert, Maine, I purchased a 1968 16-foot Boston Whaler Nauset. Our family had owned a similar 16-foot Sport that we used in and around Presque Isle Park in Erie, so I was very familiar with the boat. It was tired and needed restoration. 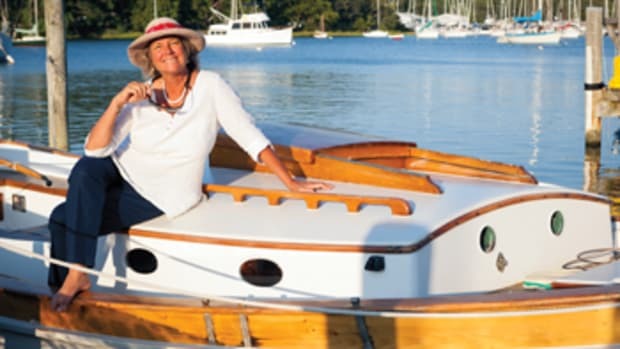 I was headed to Cleveland to work for Tartan Yachts, where I slowly restored the boat. Three years later I hung out my shingle and sold the boat; the proceeds allowed me to purchase my first suite of AeroHydro’s MultiSurf 3-D software. That was 24 years ago. Last or current boat: I currently own two Gloucester 20s, yet another late ’60s 16-foot Whaler, a 9-foot Dyer and an Opti — all for sale! Favorite boat you’ve skippered: A few years back, MJM founder Bob Johnstone had in inventory one of the last MJM 29zs built, sitting at the Boston Boatworks docks in East Boston. 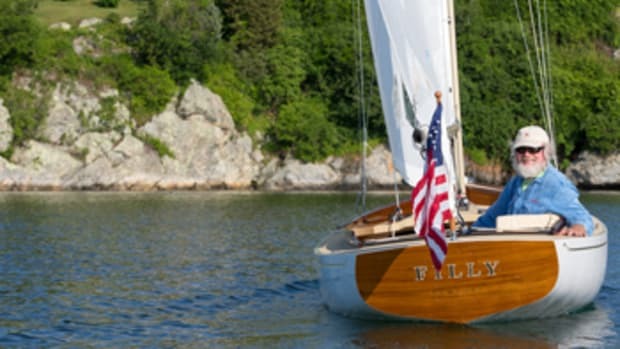 Fourth of July was upon us, and I suggested, rather than the boat sit idle, why not bring it to Marblehead where I could show off its versatility. For the next eight weeks, I had fun getting to experience one of my designs and enjoyed everything an MJM has to offer. 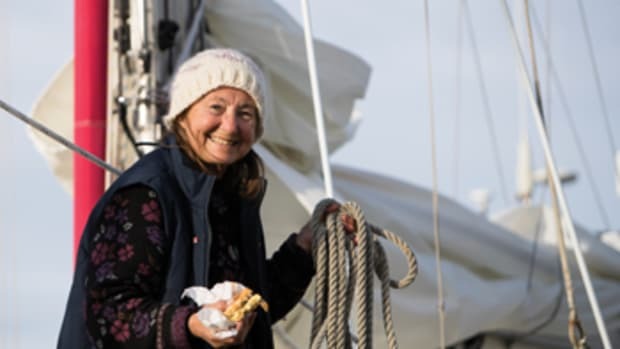 The experience culminated in a memorable delivery down Buzzards Bay in short, steep chop, cruising comfortably at 25 knots on my way to the Newport Boat Show. Your dream boat: This boat is far off on the horizon, but if I were to imagine, I would envision a powerful 56-foot pilothouse sloop, easily single-handed, with cruising amenities for myself and my wife and room for occasional visits from children, family and friends. 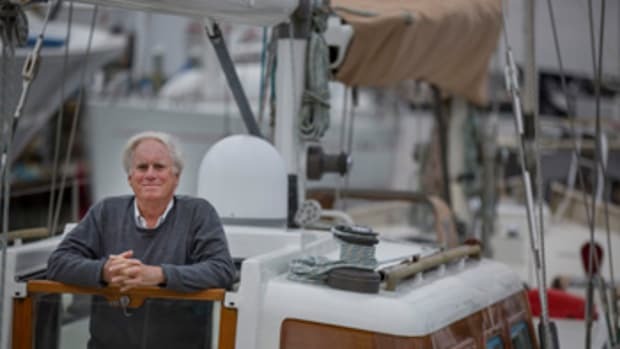 Most memorable experience aboard: The most memorable was the delivery of a Deerfoot 60 with Able Marine owner Ted Cooper. From Trenton, Maine, we sailed across the Gulf of Maine, rounding Cape Elizabeth and into Marblehead Harbor. We had favorable north-northwest breezes and clear night sailing. An abundance of wildlife accompanied us, from bald eagles soaring above Mt. Desert to dolphins, whales and mola mola, to name a few. Day three we headed out of Marblehead into a 25-knot northeast breeze with higher gusts. Fortunately for us we were headed south to Newport, so with full main and a 100 percent blade jib, I drove the Deerfoot down Massachusetts Bay alone on deck while Ted read off the speedo from below (at 16 knots). As we approached the Cape Cod Canal, we converged with a similar-sized sailboat coming from the east. As we got close it became apparent to me that the boat converging was my father’s third and last boat, a McCurdy & Rhodes 61-footer built at Palmer Johnson. What a treat to see. It was the most enjoyable 30-odd hours of sailing I’ve ever done. 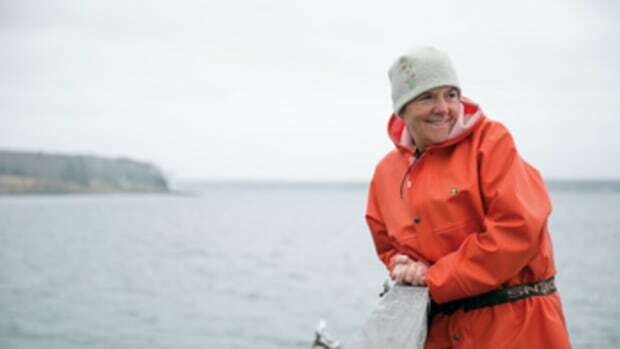 Favorite nautical book: I read Robin Lee Graham’s Dove as a teenager, and it’s always stuck with me as an inspirational story filled with every emotion, challenge and joy in life. Favorite nautical cause: I am on the Professional Advisory Committee at The Landing School in Arundel, Maine — the first school of its type to be accredited by the Accrediting Commission of Career Schools and Colleges. 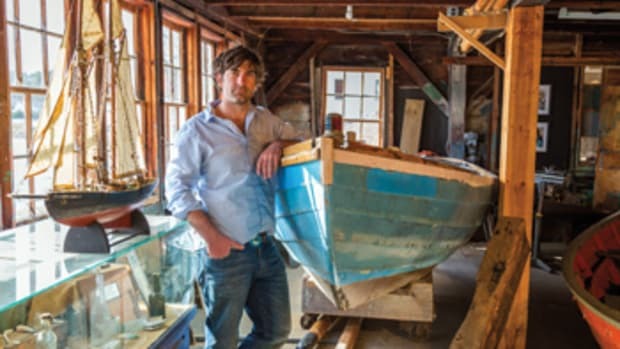 It prepares our future boatbuilders, designers and service people for what the marine industry has to offer. I enjoy sharing the knowledge I have accumulated over the years with the students, faculty and other PAC members.